If he fails to get back into the world’s top 50 and misses next year’s Masters, he will still have three majors. Even if he fails to make another cut for the rest of his career, he will be a three-time major winner. That’s the mantra for the 42-year old Dubliner right now. Before he had won a major, they were used as the yardstick by which to measure him. When he stopped winning, they became a stick to beat him with - an unfair standard of excellence to which he was held on every appearance. Having built him up in our own minds as an Irish version of Tiger Woods, capable perhaps of winning four, five or even six majors, the scrutiny grew with every reverse. Harrington consciously or unconsciously headed down routes that turned out of be labyrinths. There were still flickers of brilliance until the putting gremlins really got a hold and his confidence took a hammering. All bets were off after that. As he nears the end of his 18 years as a professional, there are signs that he has come through the worst of it. But there are still mental mountains to be scaled, as he confessed after the third round 71 that all but condemned him to missing Europe’s season-ending extravaganza. “I definitely lost my patience early on today so that’s maybe something - when you’re not making birdies out there you feel like you’re going backwards,” said Harrington, who bogeyed the first and fifth before rallying with four back nine birdies (and a late bogey). Needing a top-10 finish to climb into the top 60 who qualify for Dubai, he found himself tied for 40th on seven under, five shots outside the top-10. Another failure won’t make much difference to arguably the worst season of Harrington’s career. Shane Lowry shot a 65 in the third round. Picture: Fran Caffrey www.golffile.ieAccording to agencies, he was asked how big a blow it would be were he to not qualify on Sunday, given his status as a former European number one and major winner. Harrington responded: “Sorry to say not at all. “It doesn’t take anything away form either of those two things you just said. I need the week and I need a break. “I’m trying to make it and I’d love to be there, but bear in mind anybody who just scrambles in gets an early tee time the first day and it’s nearly impossible to come out of the early tee times next week. Of course, Harrington’s pride will mean that missing next week’s DP World Tour Championship will hurt. In the meantime, he can look to Henrik Stenson for inspiration. While it was driving, not putting, that led to the Swede’s fall from grace, his recovery from an even deeper hole will give the Dubliner hope. 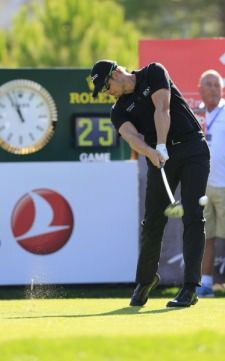 Race to Dubai leader Henrik Stenson. 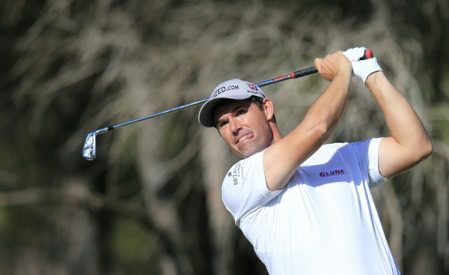 Picture: Fran Caffrey www.golffile.ieA four under 68 left him tied for third with Tiger Woods, Rafael Jacquelin and Alejandro Cañizares, six shots adrift of the 23-year old Frenchman Frenchman Victor Dubuisson, whose 63 gave him the lead on 21 under par. The former world amateur No 1 Dubuisson is five shots ahead of Ian Poulter, the runner-up in last week’s WGC-HSBC Champions, who can close the gap on Stenson at the top of the Race to Dubai to little more than €30,000. As for the rest of the Irish in action, Shane Lowry recovered from his putter problems and carded a seven under par 65 to move up to joint 53rd on four under par. Damien McGrane is three shots further back after a 72. At the PGA Tour’s McGladrey Classic in Georgia, Darren Clarke shot a one over 71 in the third round and will go into the final day 10 strokes behind leaders Chris Kirk and Briany Baird on level par.